Оne of the best a/v stand solutions is a telecom cabinet. Well, actually it is used in server rooms to hold switches, phone stations and other telecom equipment, but as you can see, it is also suitable for consumer electronics. The stands come in different heights – this one is 9 unit, meaning it holds up to 9 pieces of equipment in standard height. There are also 6 and 12 unit stands. Do not exceed 12U, or your TV will be higher than it should be. obstruction for remote control beams and allows to see the equipment education on the other. The hinges be moved to the opposite side. All the shelves inside are also perforated, meaning perfect ventilation even of ill-designed devices which tend t overheat, like an Xbox 360 console. The shelves can be easily unscrewed to change the spacing. A lot of accessories are available for such standard stands, one of the most useful being a power outlet stack. All the cables to connect external devices, like cameras, players and notebooks, which normally just lie or hang around rather untidy, but this stand can hide the unsightly heap. If you really have a desire to tidy up the wire mess, a lot of aids are available for you noble quest, like these velcro cable hooks. By the way, the sides can be detached for easy access to the back sides of the equipment inside. So now when connecting a cable to the back, you don’t have to completely pull the device out. The stand doesn’t have a back side, which on one hand gives freedom to pull cables in and out, and on the other hand easies air circulation. Don’t forget that the stand is made of metal, and metal doesn’t burn and has excellent heat transferring properties, which is important for high-power electronics. 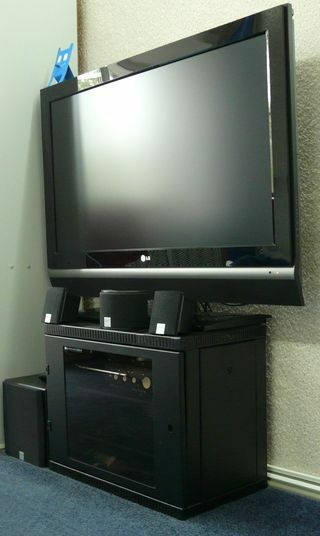 To conclude, telecommunication cabinets make best electronics stands, and also are a perfect design match.